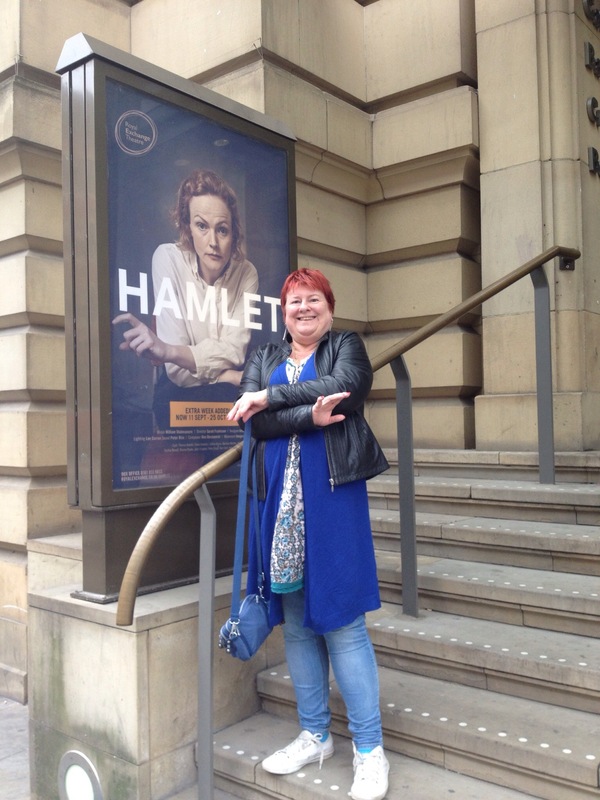 I saw Maxine Peake as Hamlet back in September 2014. Seeing the production live was an amazing electrifying experience. Of course, I was curious to see if Peake would play Hamlet as a man, or as a woman. Actually, she played the part as neither. The male pronoun was retained and the rest of the characters referred to Hamlet as a man. However, Peake’s Hamlet was really gender neutral. This production was about the person and not the gender. There were other gender swaps, Polonius became Polonia (Gillian Bevan) and Rosencrantz was played by the incredible Jodie Mcnee. McNee had just played Viola at the Liverpool Playhouse so will have been getting used to gender swap, but here her portrayal of Rosencrantz was very effective and at times gave a hint of a crush on Hamlet. Seeing the production again in a cinema was a strange one. Manchester Royal Exchange is a theatre in the round, it challenges you to look around you, to be alert to the different entrances and exits. It’s a dynamic space that puts you close up to the action. The screening also puts you close to the action, but the camera chooses how you see things. It directs your eye to look right into faces, and follows characters around the stage for you. Most of the time you follow Hamlet, when he sits down for the wedding feast, and as she crumples in grief in her to ‘to solid flesh’ speech. That’s to be expected, but I’m also interested in how the other characters respond, and in a cinema screening those moments can be cut. There are also shots you just wouldn’t get in the theatre, such as looking down directly at all the clothes that become Ophelia’s grave, and we also got a birds eye view of the laying out the dress to show this was Ophelia’s burial. I think I am happy watching screened versions of Theatre productions as a follow up to seeing the production myself in the theatre. For me, the screening is not a substitute for being in the theatre and close to the action.